Can you save money on your utility bills? 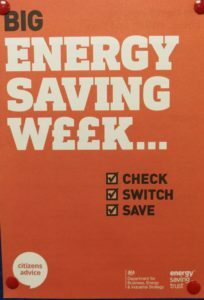 Citizens Advice Big Energy Savings Week runs from 21st – 25th January this is a national campaign to help people check, switch and save on their energy bills. As part of this campaign members of our team will be in Tesco’s Superstore, Birmingham Road (Burnt Tree Island) Dudley on Friday 25th January between 10 am and 2 pm. Please come along and discuss your energy queries including switching supplier, smart meters, and eligibility to the Warm Home Discount and/or the Priority Register. Citizens Advice Dudley Borough makes the front page of The Dudley News!